Real estate is an important part of historical and genealogical research. 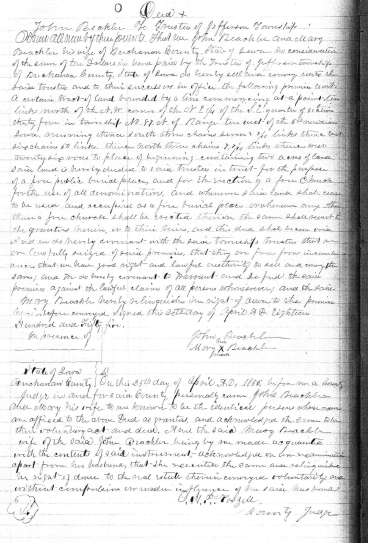 Real estate records do not generally tell you when a house or business was built, when your ancestor was born, how they died, or who their parents were. They do however provide a significant amount of detail on your ancestor’s life. The records can help to determine when they moved to or from an area, what their occupation may have been, their financial status, or mention other individuals in their FAN club (family/friends, associates, neighbors). When a real estate record is located, efforts can be made to locate other pertinent records, such as court records, tax records, maps or newspapers. Without attempting to locate real estate records, gaps will likely be left in our research. After all, don’t most researchers want to know how many acres their ancestor farmed, how close they were to town and the circumstances of their property acquisition and sale among other details of their ancestors’ lives?